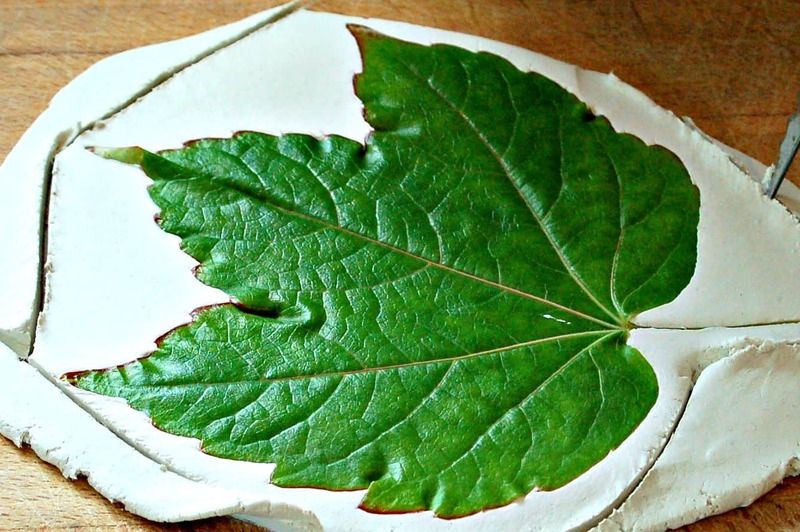 We used the leaves we gathered both to make prints on our clay, and also as templates to make little leaf dishes. Here, we are using air-drying clay, so our pieces will not be waterproof; I’d recommend sealing them with a coat of varnish or pva glue if you want to extend their life and be able to wipe them over in the future. First we donned our wellies, and went out to collect leaves. We looked for big robust leaves to make our dishes that had well defined ribbing; after lots of examining we chose plantain leaves and those from the creeper that grows on our house. 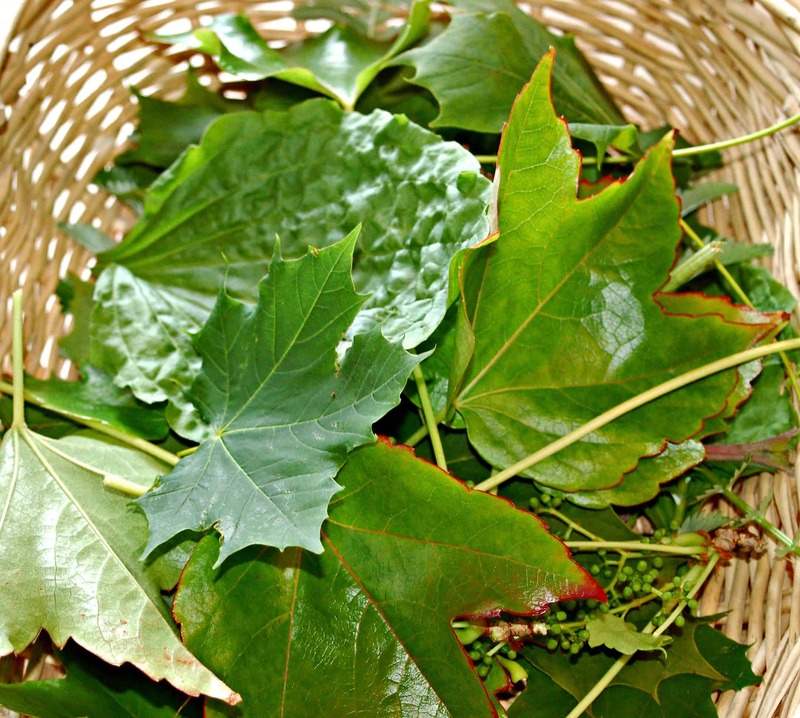 We also collected smaller more delicate leaves to use for our imprints. 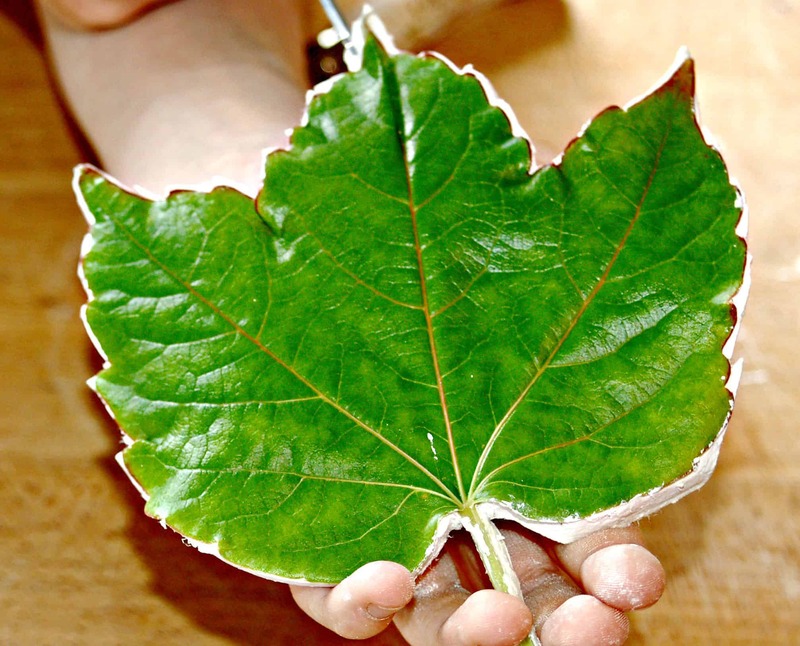 Once the kids had chosen a leaf each, they rolled out the air-dried clay to the thickness we wanted (about 3-4mm), then placed the leaf on it and rolled it flat into the surface. 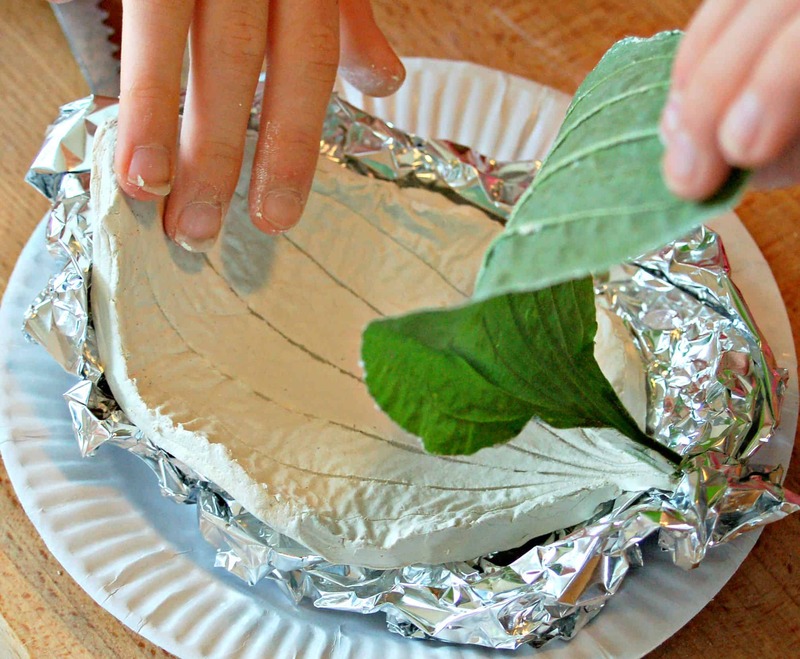 The kids used a combination of knives and scissors to cut around their leaves and clay, and used tin foil to support the leaves in a gentled curved shape ready to leave to dry. 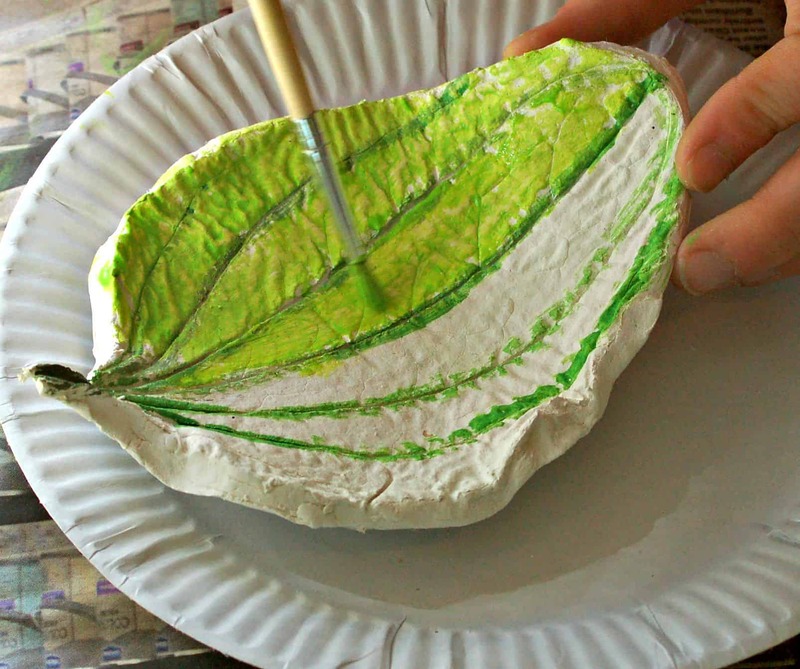 Once safely cradled, they gently removed the leaf from the clay, exposing the pattern underneath. We left our clay leaves overnight to dry. Once dry, the kids got busy painting them! Originally I had planned to suggest using pens to pick out the detail once the leaves were painted, but in fact, the paint really highlighted the detail as you can see in the photos, so we didn’t need to. 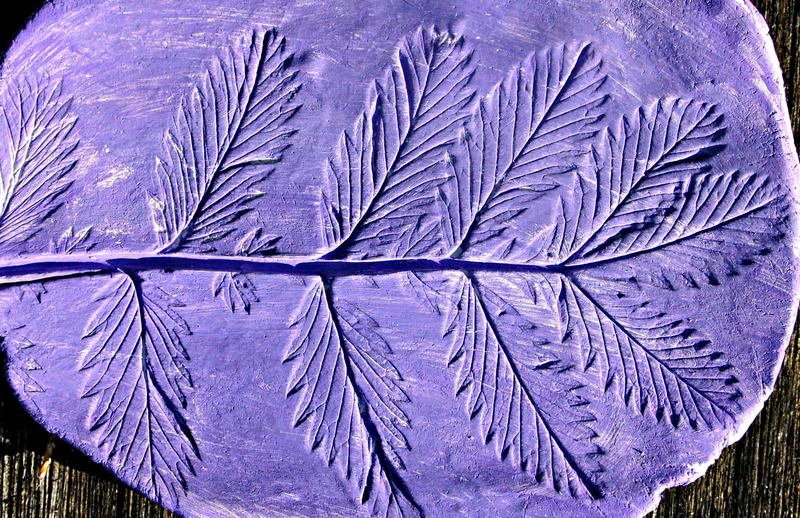 We used the smaller, more delicate leaves to make imprints on plaques of clay, which also looked great! 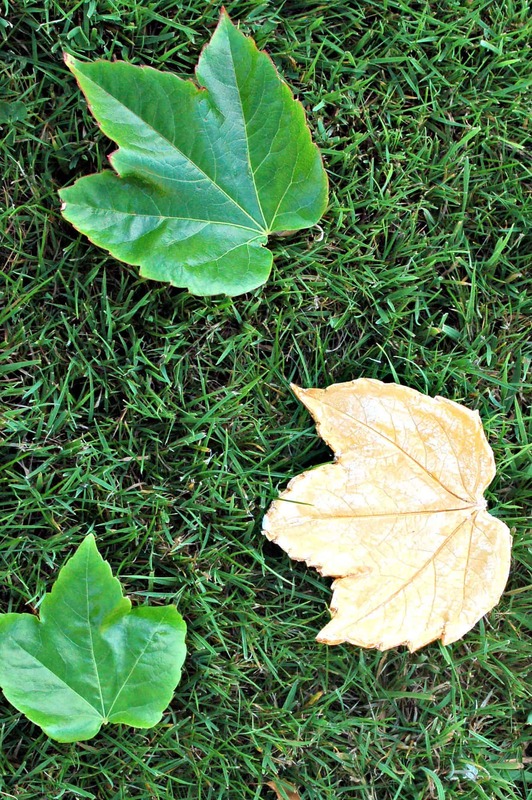 The kids loved this activity, it was clear they were delighted with the results, and there was lots of talk between them about why leaves might have the structure they do while they were working away. For more nature craft inspiration, please check out our Making Willow Balls tutorial, and our Sticky Nature Pictures. very innovative idea , I am going to try it and will tell others as well , thank you so much for the post . Hi Sarah, how clever and so much fun to do! Where were you when my two were small? They (and I) would have loved doing this. 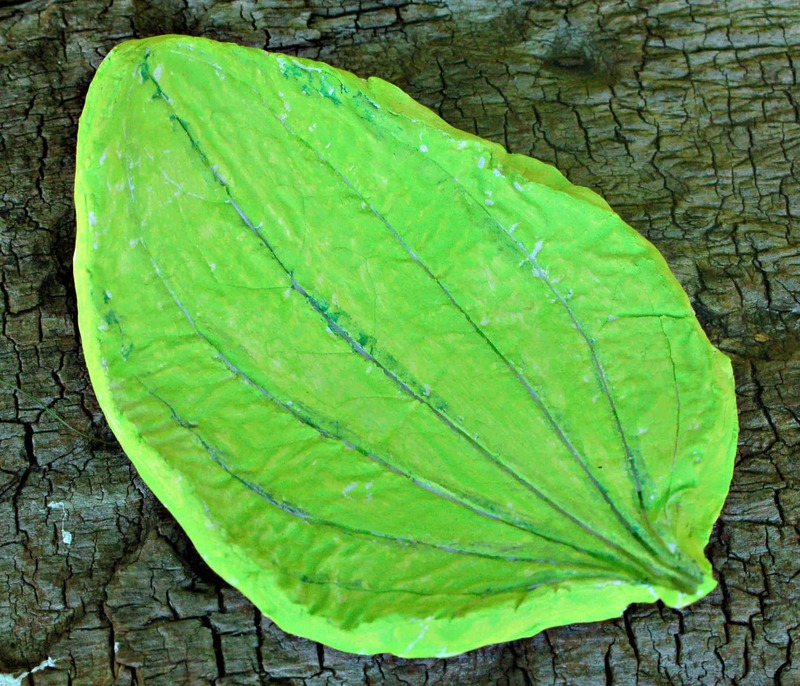 The detail of the leaf is so clear on the clay too. Excellent! I was amazed at the detail – it’s fab isn’t it. We’re helping at a craft event during half term, and this is top of the list of the activities we’ll are taking! I love this so much Sarah. The paint really does look like veins in the leaves. And the purple plaque is a piece of art. Look at all the details that show through! I am left speechless. Really great, and it’s no wonder the kids had so much fun. Nature really is amazing isn’t it! And I hope the kids learn lots about it without even realising when we are crafting! Oh my the kids must have had an absolute ball finding the right leaves and then seeing how beautiful their bowls turned out. Great craft Sarah. They look great, I love this idea. Wow- lovely idea. So simple and effective. Will be giving this one a go! I love these! I made something similar for my mum’s birthday when I was at uni and strapped for cash. The only difference is that I clingfilmed inside a bowl and placed the clay leaf shape inside to get a bowl shape. I love these, they look amazing and will be treasured for many years to come! I absolutely love this!! 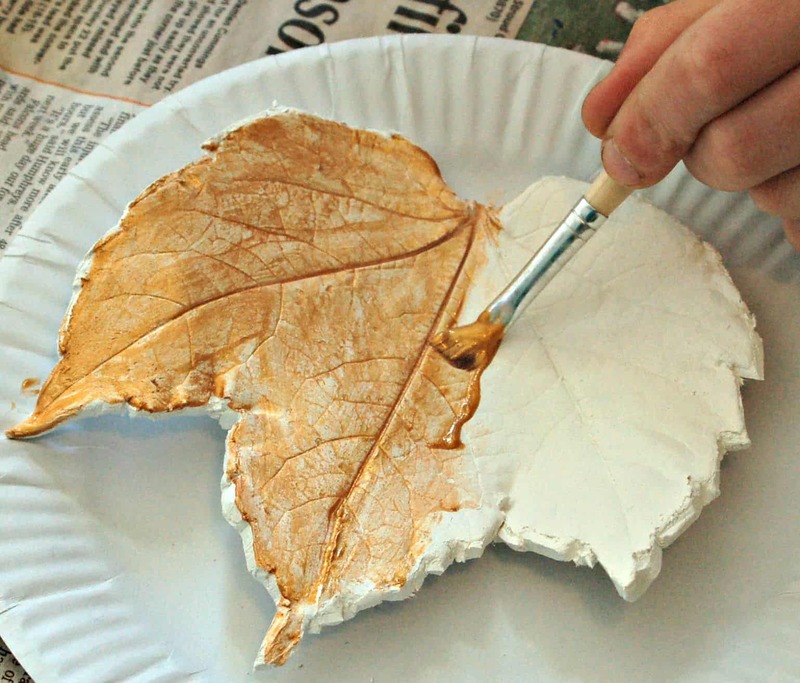 Such a simple idea but those finished leaves are so beautiful – the detail is amazing. I must have a go at this with mine this summer. Thanks for sharing this! 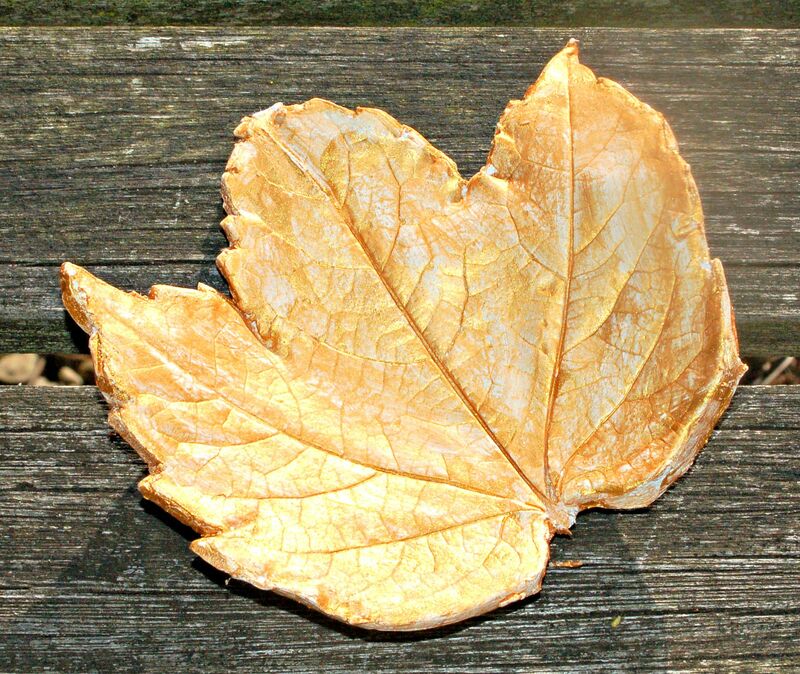 I love this, such a simple craft yet so effective, I guess the more structured the leaf the better as it will have the surface needed to create the pattern. Paining them really does bring out the design too. Thank you for linking up to Country Kids, though you may also want to link to my Monday linky Trash 2 Treasure which is for all recycling projects from rubbish or nature, this really does fit them both!